Fun Things – Fun Things – 1980 – Cat# PRS-2783 Gifted to me by high school friend Brad Shepherd, hot off the press in 1980. 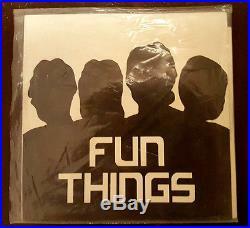 This is The Fun things original EP release from 1980 released on EMI Custom Records. This was an unsigned, independent release off the bands own back. All the tracks are excellent, raw garage rock produced the boys while they were still in High School. I hope it finds a good home. High quality images below. When The Birdmen Fly. (I Ain’t Got) Time Enough For Love. Lead Guitar, Backing Vocals. Lead Guitar, Piano, Lead Vocals. Recorded at Forest Glen Sound, Queensland, Australia, 10th February 1980. Special thanks to Ben Castan and Doc Norris for their support. All songs: Machine Music. 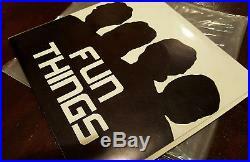 The item “Fun Things Original 7 Vinyl EP 1980 MINT COND Brad Shepherd, RARE Hoodoo” is in sale since Monday, January 30, 2017. This item is in the category “Music\Records”. The seller is “theedge-ucators” and is located in Brisbane, QLD. This item can be shipped worldwide.